Charleston, South Carolina (CNN) — Diver Brian Tovin swam deep into South Carolina’s Cooper River in search of fossils and relics. In 40 feet of murky water, fighting the current, something shiny caught his eye. “Without even shining my light on it, it was clear that it has weight to it, and it was metal or gold,” Tovin said. “And when I shined my light on it, I said, wow, this is the first time I’ve ever found jewelry underneath the water,” he said. But it was more than just jewelry. It was a ring that had become the “stuff of legend” since the owner lost it nearly 40 years ago. “I held onto it for the rest of the dive. I just didn’t want to lose it,” Tovin said. Inscribed on the large, gold ring were the initials RLP and the date 1974. 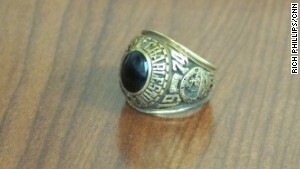 The ring also displayed the name of a nearby school: the College of Charleston. With those clues, Tovin’s journey to return the jewelry began. The large, gold ring had the initial RLP inscribed inside it. Tovin first called the college’s alumni association. The college determined that only two people who graduated in 1974 had those initials, and one was female. Now, Tovin knew who he was looking for: Robert LeVaughn Phillips. After searching on social media, Tovin eventually connected with Robert’s son, Eric Phillips. Tovin quizzed him to make sure he had tracked down the rightful owner. Phillips e-mailed a copy of his father’s diploma, and Tovin was convinced he was in the right place. Tovin soon learned that like so many other things in life, this very simple college ring — lost for so many years — had more meaning to it than many will ever understand. “My dad was a storyteller, kind of a used-car salesman at times,” Eric Phillips said. “He kind of has some of the same jokes, but he talked about the ring all the time because it came from his mother, and you know it’s just one of the stories that just epitomized a season of his life,” he told CNN. Robert Phillips was boating on the Cooper River with his future wife, Nancy, when he lost the ring in 1974 — just two weeks after he got it. “He was very upset and hated to tell his mom that he lost it,” Nancy Phillips said. “Losing it in the river, we never thought we would never, ever, ever see it again,” she told CNN. Growing up without his father in his life, Robert Phillips was determined to succeed on his own. He graduated from the College of Charleston with a degree in business administration. The ring, a symbol of all he had accomplished, was his mother’s last gift to him before she passed away from pancreatic cancer. 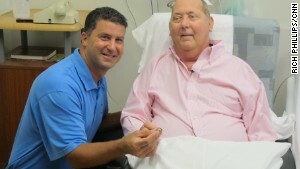 Tovin hoped he could return the cherished ring to Phillips at his home, but Phillips — now fighting cancer — was not there. He was rushed into surgery at the Medical University of South Carolina in Charleston last weekend for brain surgery. That setback didn’t stop a reunion 39 years in the making. A few days after Phillips’ operation, Tovin met Phillips in the hospital. With his family by his side, Phillips sat in a hospital chair. His voice was barely above a whisper, but it was full of life as a stranger returned a part of his life to him. Down on one knee, Tovin opened up a ring box to reveal Phillips’s lost treasure. “I was down there fighting strong currents and alligators trying to get you your ring back,” said Tovin, as Phillips smiled. Brian Tovin returns the long-lost college ring to Robert Phillips. “And I’ve got it here, and I know this is going to look like I’m proposing to you, so please don’t tell my wife, OK,” he said, as the room erupted in laughter. “Wow. That is awesome,” Phillips said. Then, Phillips began to tell Tovin and everyone the story that his family has heard endlessly — the story of the lost ring. “I was on the back of the boat. And I decided I needed a beer,” he said softly. “I pulled the pop top and when I did, my finger got caught in the pop top, and it went with it,” he told Tovin. “I guess I have to go have it sized now, don’t I,” he added with a grin. “You’ve got a lot of years left. So, you’re going to be wearing that ring,” Tovin responded. With his wife and two children watching this reunion of sorts, they all felt this ring would give their patriarch the comfort he needs right now. “No matter how much time he has with us, we’ll always have that ring. And it will always signify a good season of our life and a good memory of our father, and the fact that he got to share in it before he left us,” Eric Phillips said. In some ways, this decades-long loop of life has been closed, and a new story — one that the Phillips family will be telling for generations — has been written. “Thank you Lord that I got it back,” Robert Phillips said. “I had a nightmare the other night that I lost it again,” he said. “No more beer cans,” he laughed.